I have been craving green beans lately! 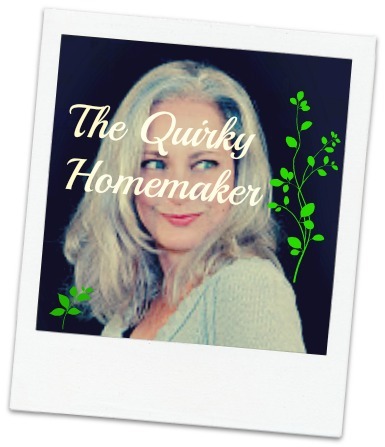 I never usually buy them fresh or eat them that often, but the last two times I've gone to the store, I've bought fresh green beans to stock in my kitchen fridge. I used my last batch in that Salmon & Supergrain Salad that I made last week. 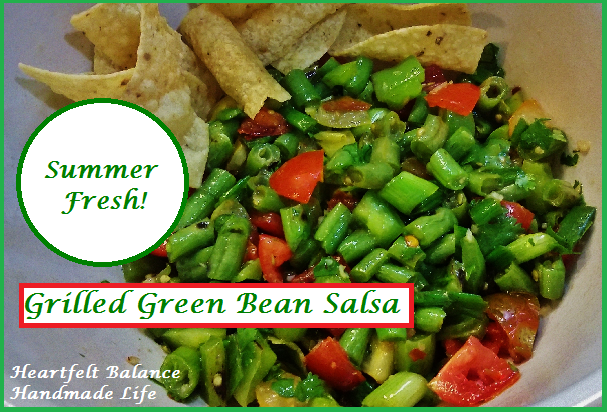 For some reason I've also been craving cilantro, so I decided to make a green bean salsa this week. Yummo! My daughter ate it straight from a bowl with a spoon. I ate it with tortilla chips like a traditional salsa. It would probably be good mixed with quinoa or rice to make a side dish also. I seriously had to stop my daughter from eating it so that there would be some left for my hubby to try! I just love the fresh tastes and bright colors of Summer time. When it's hot outside, the fresh food just feels right. If I would have had lime juice, I probably would have used lime juice instead of rice vinegar. Alas, I had no lime juice. Don't cilantro and lime just go well together??? When I was shopping at Aldi today, they also had a package of cute multi-colored "Sweet Medley" tomatoes. I love the variety. I love it when they mix things up. Wipe indoor grill pan with oil. Preheat grill pan over medium-high heat until heated. 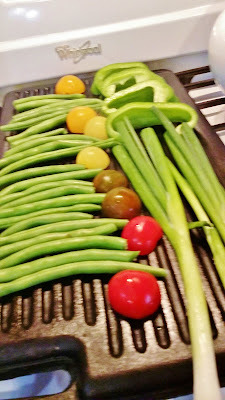 Place green beans, green peppers, cherry tomatoes and green onions on grill. 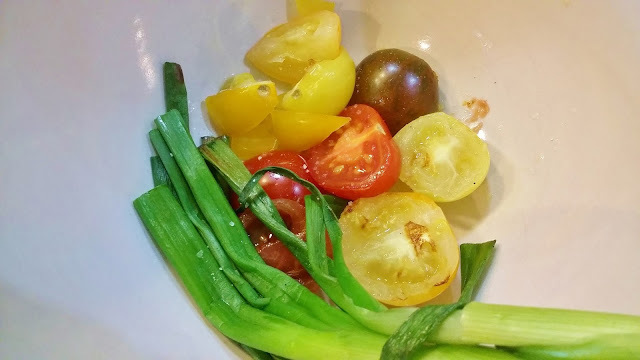 Remove tomatoes and green onions after 3 minutes. Leave green beans and peppers on the grill for 7 more minutes (10 minutes total), flipping them occasionally. 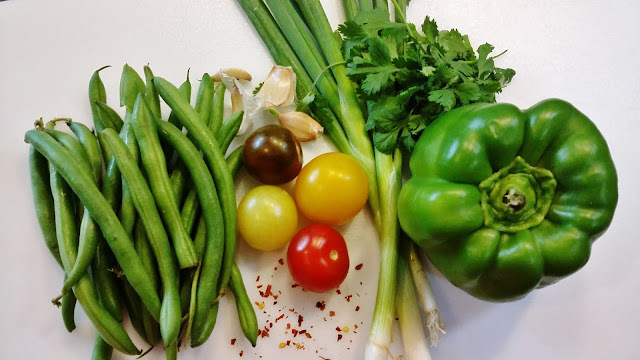 While green beans and green peppers are still cooking, place cherry tomatoes in bowl and cut with kitchen shears. 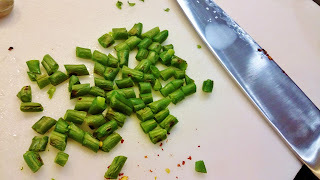 Cut green onions with kitchen shears into bowl. 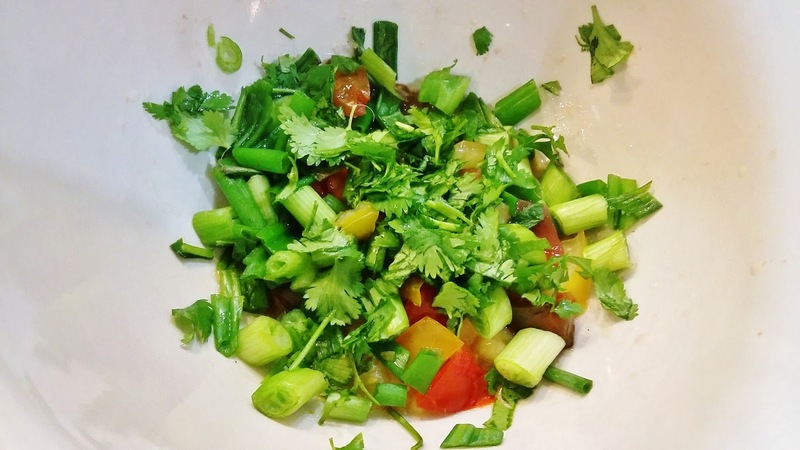 Chop cilantro and put in bowl with tomatoes and onion. Add minced or pressed garlic into the bowl. When green beans and peppers are done, cut into 1/4 - 1/2 inch pieces. Add to tomatoes, onion & garlic. Pour 3 Tablespoons olive oil over the vegetables. Pour the 1 teaspoon of rice vinegar over vegetables. Sprinkle on the salt, cumin and crushed red pepper. Either eat immediately or chill so that the flavors can meld. What's your absolute favorite salsa?